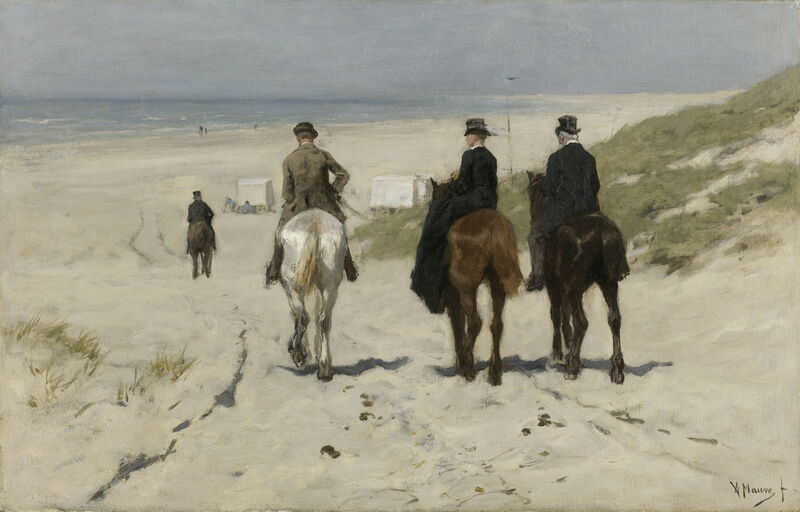 Anton Mauve (1838–1888), Morning Ride Along the Beach (1876), oil on canvas, Rijksmuseum Amsterdam, Amsterdam. Wikimedia Commons. For those painting coastal landscapes, the flat dunes, beaches, and marshes of much of the North Sea coast are a problem. No matter how beautiful or visually fascinating they might appear in real life, when depicted on a flat canvas they can quickly become monotonous. This article looks at how painters – particularly those from the ‘Low Countries’ of modern Belgium and the Netherlands – have tackled this. 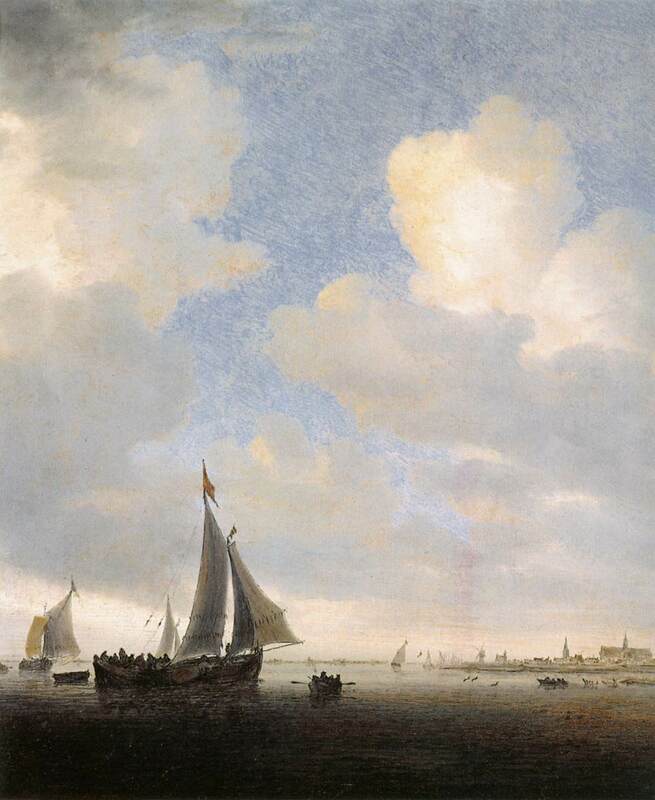 Landscapes became common motifs for the artists of the Dutch Golden Age who were among the pioneers of the genre, and several explored the even newer sub-genre of marine painting. Simon de Vlieger (c 1600/1601–1653), Beach View (1643), oil on panel, 60.6 x 83.5 cm, Koninklijk Kabinet van Schilderijen Mauritshuis, The Hague, The Netherlands. Wikimedia Commons. Simon de Vlieger’s Beach View from 1643 uses boats, many figures, and careful composition to swell the land over the bottom of its panel. It shows well, though, how important is the sky – here rendered marvellously, with a small group of white birds shown against the grey of the clouds. Jan Josefsz. van Goyen (1596-1656), View of Dordrecht with the Grote Kirk Across the Maas (1644), oil on oakwood, 64.8 x 96.8 cm, Walker Art Gallery, Liverpool, England. Wikimedia Commons. Jan Josefsz. 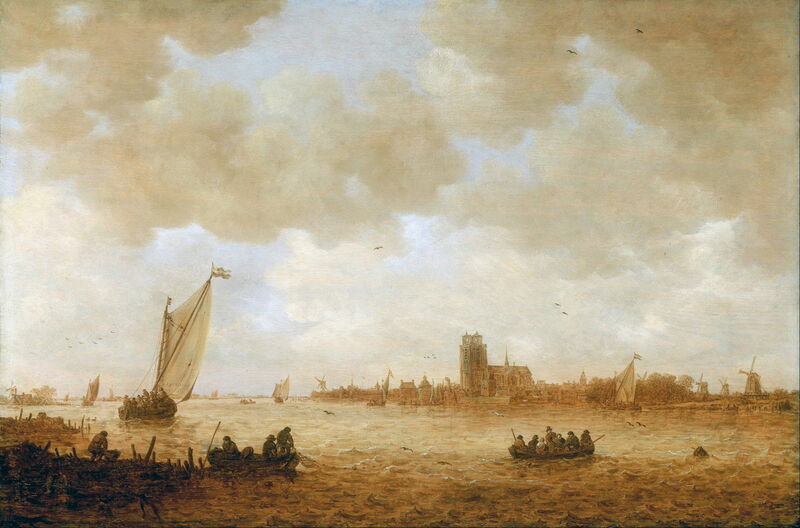 van Goyen’s View of Dordrecht with the Grote Kirk Across the Maas (1644) shows a view which will here become familiar, with particular interest in the city’s buildings. Its skyline is dominated by the still-unfinished 65 metre tower of the Grote Kerk, which was built between 1285-1470. At the edges of the city are several windmills, which were already associated with the Netherlands. Aelbert Cuyp (1620–1691), A View of the Maas at Dordrecht (c 1645-46), oil on panel, 50.2 x 107.3 cm, J. Paul Getty Museum, Los Angeles, CA. Wikimedia Commons. Aelbert Cuyp’s slightly later View of the Maas at Dordrecht (c 1645-46) emphasises the river traffic more, looking downstream at both banks of the river. Salomon van Ruysdael (c 1600/1603–1670), View of Alkmaar from the Sea (c 1650), oil on panel, 36 x 33 cm, Private collection. Wikimedia Commons. Salomon van Ruysdael’s View of Alkmaar from the Sea (c 1650) is unusual in showing such a flat coastal landscape on a panel orientated not in landscape mode, but in portrait. This gives the artist even greater scope for a fine cloudscape. Jacob van Ruisdael (1628/9-1682), The Shore at Egmond-aan-Zee (c 1675), oil on canvas, 53.7 x 66.2 cm, The National Gallery (Bought, 1893), London. Image courtesy of and copyright The National Gallery. 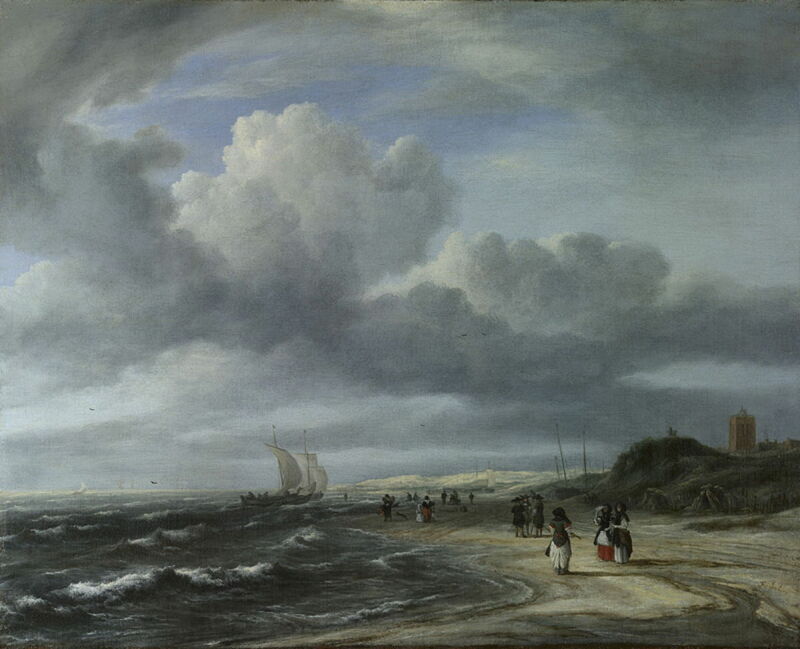 Jacob van Ruisdael’s The Shore at Egmond-aan-Zee (c 1675) was painted to the west of Alkmaar, in North Holland, and couples devices similar to those of de Vlieger’s Beach View above with its stormier weather. Flat coastal landscape paintings became less popular after the Golden Age. As the focus of landscape painting shifted to Italy, waters were warmer and the topography more vertically varied. Curiously, it was an Englishman painting on the north coast of France who next rose to the flatlands challenge, and in doing so started laying the foundations for Impressionism. Richard Parkes Bonington fell in love with the Normandy coast, and in his tragically brief career often painted it at its flattest. His Les Salinières near Trouville (1826) is believed to have been painted in his Paris studio from memory of a tour there the previous year. It shows traditional salt pans, which were used to make sea salt, a view considerably enhanced by Bonington’s inclusion of trees, which even provide gentle repoussoir. Bonington also made his task easier by using a ‘marine’ support, with an aspect ratio of almost 2:1. Later artists pushed that up to 2.5:1 and more on occasion. The Italian Impressionist Giuseppe De Nittis painted this Seascape near Naples in 1873, early in his career, and shows how even a thin strip of land can almost fill the view. 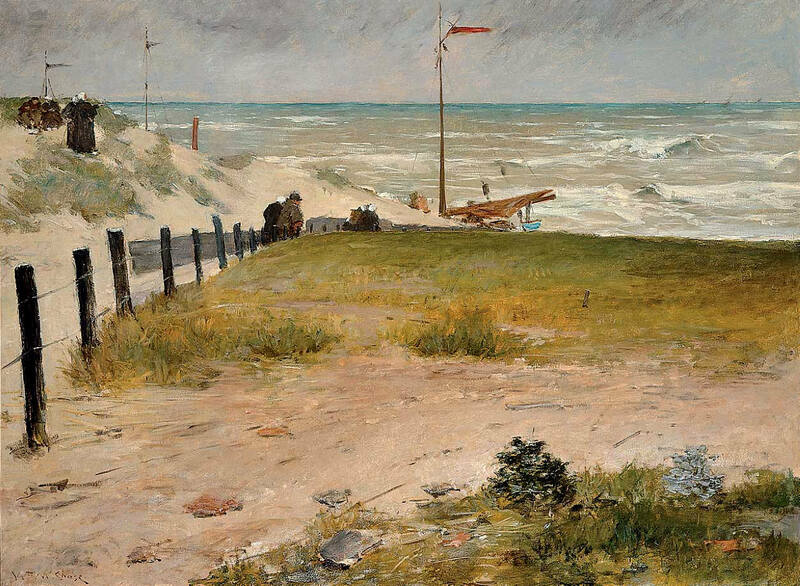 The late nineteenth century saw a new school of landscape painting in the Low Countries: the Hague School, which brought a fresh wave of views of flat coasts. Willem Roelofs (1822–1897), Seascape at Heijst (c 1868), oil on canvas, 27.5 × 54.5 cm, Rijksmuseum Amsterdam, Amsterdam, The Netherlands. Wikimedia Commons. 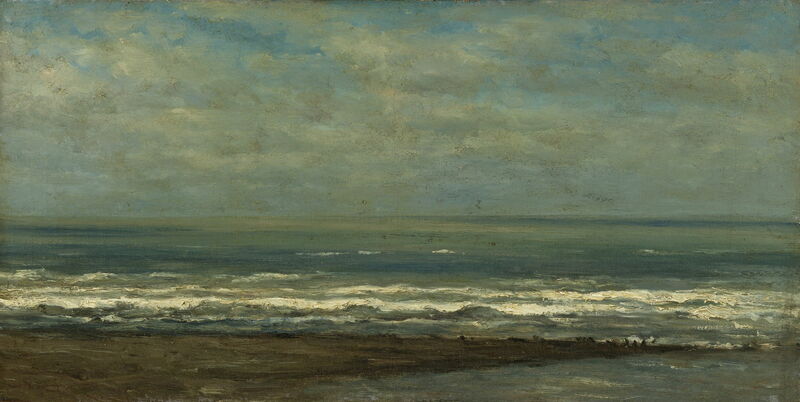 Willem Roelofs’ Seascape at Heijst from about 1868 brings a new and direct simplicity. There are no boats, carriages, or people added to increase interest here, just the three strips of land, sea, and an amazingly textured sky. 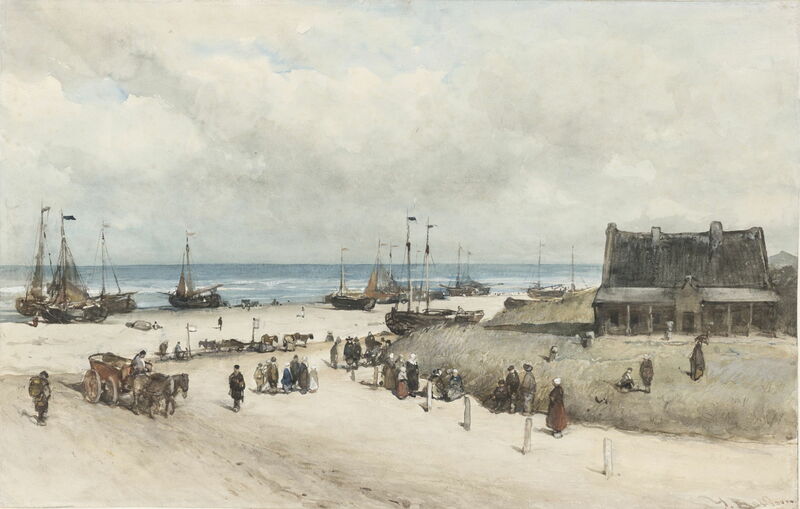 Johannes Bosboom (1817–1891), The Beach at Scheveningen (1873), black chalk, watercolor and white gouache on paper, 35.5 x 55.2 cm, Rijksmuseum Amsterdam, Amsterdam. Wikimedia Commons. Johannes Bosboom’s view of The Beach at Scheveningen (1873) captures this popular and famous beach when it was a hive of activity. 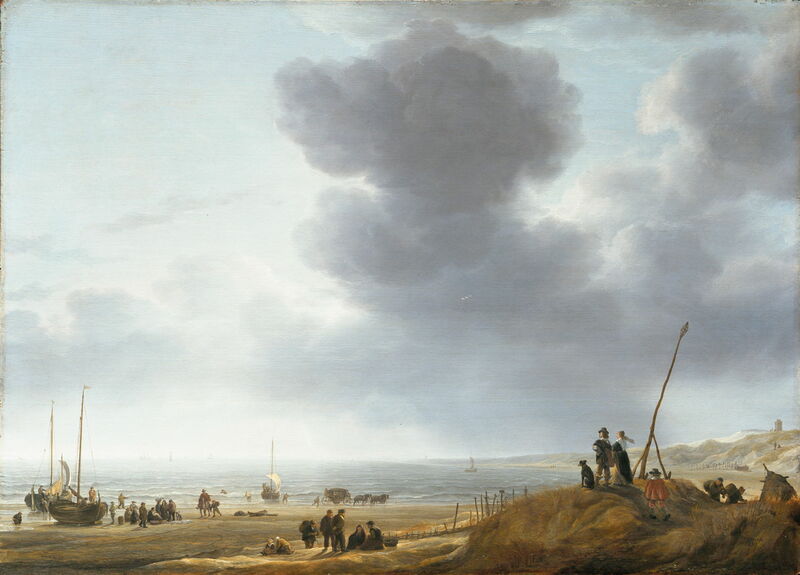 The numerous fishing boats, people, and the dominant building show a return to the compositional features of de Vlieger’s Beach View. Anton Mauve’s Morning Ride Along the Beach (1876) enlarges the equestrian element, and features white bathing machines behind the horses. 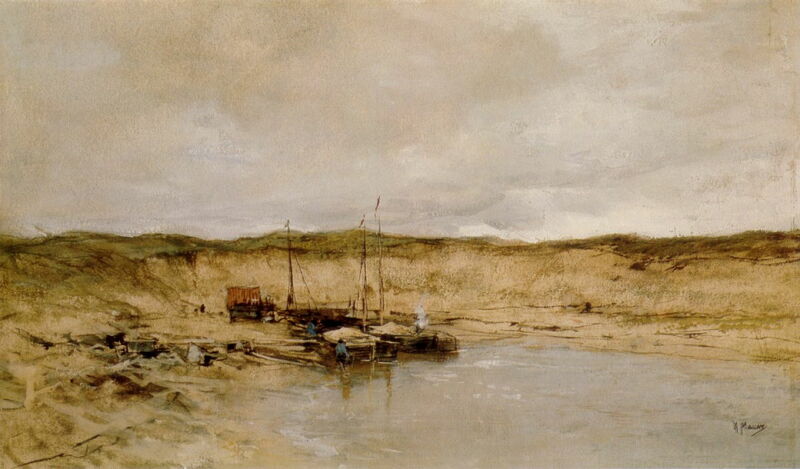 Anton Mauve (1838–1888), Sand Mine at Scheveningen (date not known), watercolour, 29 x 48.6 cm, Gemeentemuseum Den Haag, The Hague, The Netherlands. Wikimedia Commons. Mauve’s undated watercolour of a Sand Mine at Scheveningen shows an unusual industry eating away at the dunes. Impressionist landscape painters had a preference for more rugged coastal cliffs, but a few took to the dunes around the North Sea. William Merritt Chase, The Coast of Holland (1884), oil on canvas, 150 x 203.2 cm, Frye Art Museum, Seattle, WA. WikiArt. William Merritt Chase painted The Coast of Holland out of season in 1884, with the wind whipping up the sand against the few hardy souls out for a stroll. He has also shifted attention from the sky, here playing a minor role, to the scrub vegetation on the dunes in the foreground. Although better known for the grandeur of its fjords, Norway also has a lot of very flat coastal areas. 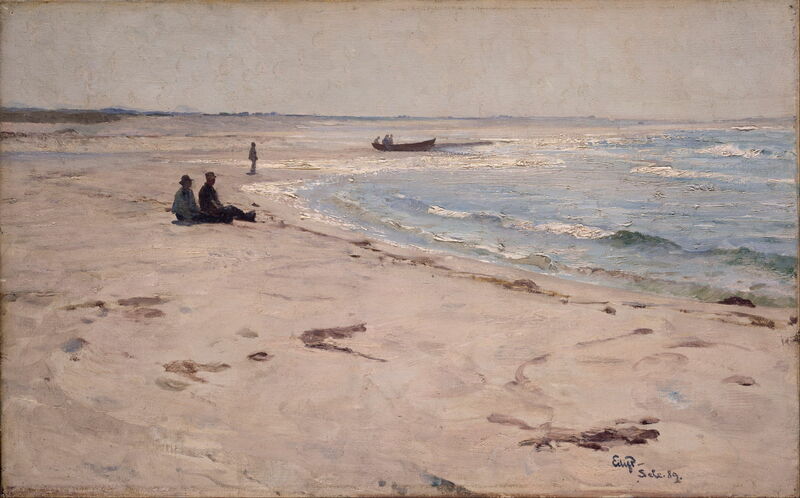 Eilif Peterssen’s From the Beach at Sele (1889) shows one such area, and the contrast between fishing activity and inactivity. 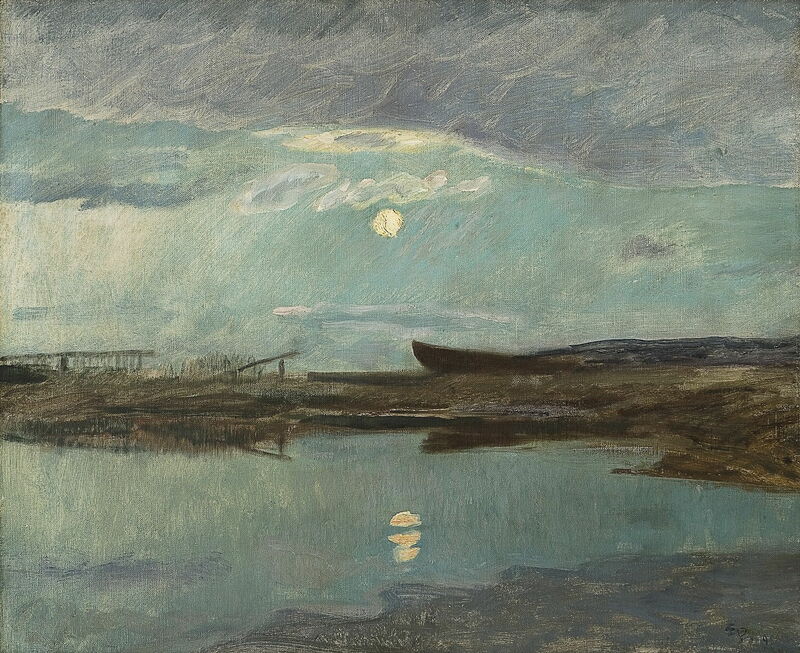 Some of those on the periphery of Impressionism painted nocturnes over flat landscapes, including coasts, in which the moon, its reflection, and cast light are important. This example is another of Peterssen’s paintings, his Coastal Landscape in Moonlight (1898). 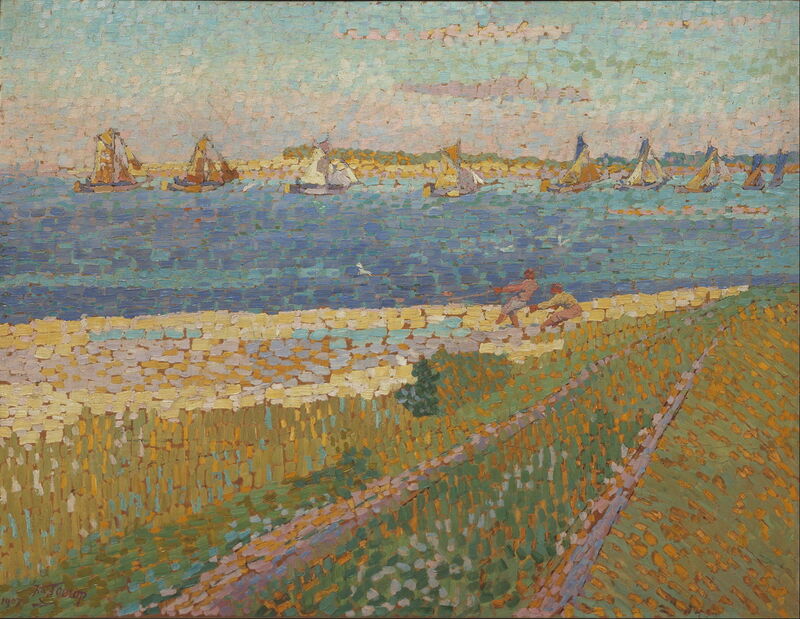 Jan Toorop (1858–1928), The Schelde near Veere (1907), media not known, 47.7 x 62.2 cm, Centraal Museum, Utrecht, The Netherlands. Wikimedia Commons. Jan Toorop’s Divisionist painting of The Schelde near Veere (1907) uses an ingenious composition to bring the land into view twice, and employs boats and people as well. Prior to the First World War, very few coastal landscapes used imaginary elevated viewpoints to enhance the view. Once painters started seeing the world from aeroplanes, the bird’s eye view appears to have become more common. Paul Nash (1892–1946), The Shore (1923), oil on canvas, 62.2 x 94 cm, Leeds Art Gallery, Leeds, England. The Athenaeum. 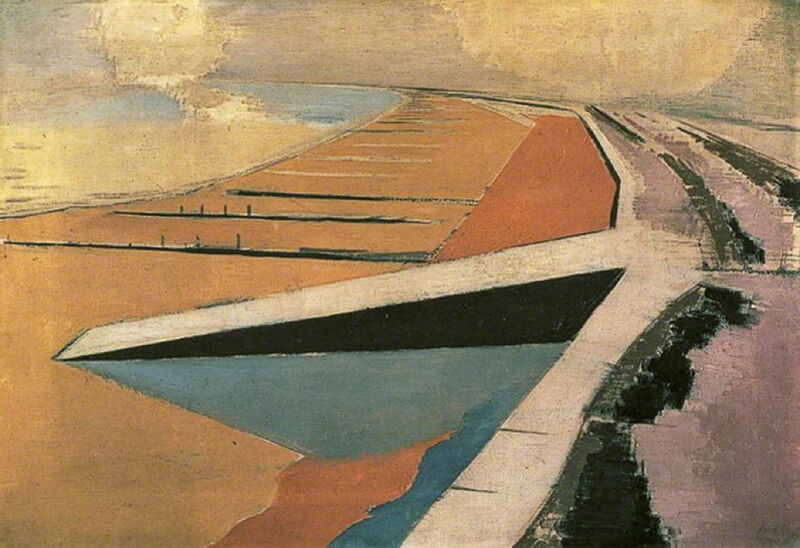 Paul Nash seems to have taken to the air to paint The Shore in 1923. Showing the seafront of south Kent and its extensive concrete defences, Nash here emphasises its simple planar geometry. This was made at the tail end of a period in which viewers enjoyed seeing such panoramas, on both sides of the Atlantic. Unfortunately for Mesdag, the company exhibiting the panorama as an entertainment went bankrupt in 1886. Mesdag bought it back, and it remains housed in its dedicated building. Hendrik Willem Mesdag, Panorama Mesdag (detail) (1880-1), media not known, 1400 x 12000 cm, Panorama Mesdag, Den Haag. Wikimedia Commons. Which all goes to show how a good painter can transform even dull flat coastal views into works of art which the public will pay to see. Posted in General, Painting and tagged Bonington, Bosboom, Chase, Cuyp, de Nittis, de Vlieger, Golden Age, Hague School, landscape, Mauve, Mesdag, Nash, painting, Peterssen, Roelofs, Toorop, van Goyen, van Ruisdael, van Ruysdael. Bookmark the permalink.